I found Advanced Custom Fields (also known as ACF) about 6 months ago while working on a project for a client. They didn’t want to have to mess around with editing the Custom Fields that come native with WordPress, it just wouldn’t have worked as smoothly. The client needed to require one image, one PDF, one year selection, and one category. The category consisted of two options, “Weekly” or “Daily”. If you’re wondering, it was a newspaper client who wanted to categorize their posts as being either a “weekly issue” or a “daily issue”. Makes sense for a newspaper! Getting the native WordPress custom fields to play along well with files can be tricky, and probably not worth the effort, especially with a plugin like Advanced Custom Fields around. So, enter the hero of this post, Advanced Custom Fields. I was able to set everything up with Advanced Custom Fields within about 20 minutes, and that even counts the time that I took to make various theme templates pull data from Advanced Custom Fields. The actual setup of Advanced Custom Fields took about 2 minutes. I’ve since started using Advanced Custom Fields here at longren.io, too. Independent Publisher, the WordPress theme I’ve been using, likes to show one main category when you’re viewing a single post, even if it’s not the most relevant category. So instead of a post about WordPress having the Git category shown at the top, I can now specify which category I want to be shown. So, for a post like this, I would obviously choose WordPress as my primary category. I’ve already added the necessary parts to my Independent Publisher child theme, and have sent a pull request to Raam Dev to get his thoughts. It’s a very easy thing to support in a theme, however, it requires that everyone using that theme use the same field name in ACF. I named my field primary_category, since that’s exactly what it is. After you’ve added your “Primary Category” custom field, you can then use the value of that field throughout your theme. I’ll have a short post later this week on exactly how you can display the primary category value in your theme. Or, if you want to know right now, you can see this pull request at GitHub. As you can tell, Advanced Custom Fields is a beast of a plugin. I also love that Advanced Custom Fields is totally free, which is kind of amazing to me. I’ve come across many paid plugins that are nowhere near as polished and user friendly as Advanced Custom Fields. Advanced Custom Fields doesn’t skimp on the documentation, either. Their documentation site is extremely helpful, I never once ventured away from it while getting familiar with Advanced Custom Fields for the first time. You can download Advanced Custom Fields from the WordPress Plugin Directory, so you can also install it in just a few clicks, right from your WordPress Dashboard! 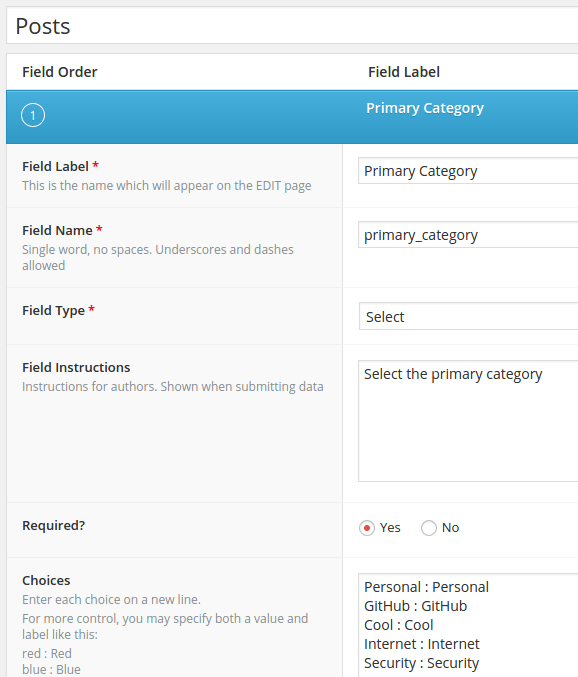 Advanced Custom Fields is developed primarily by Elliot Condon, and can also be found on GitHub. The great thing about this is that it can be applied to any theme, not just Independent Publisher. So, if you’re not using Independent Publisher, just setup Advanced Custom Fields as I described and make the necessary changes for your theme. A follow-up post will have more details on using data from Advanced Custom Fields, no matter what theme you’re using. WordPress Database Reset is a WordPress plugin I recently came across that will at some point prove very, very useful to me. WordPress Database Reset is a secure and easy way to reinitialize your WordPress database back to its default settings without actually having to reinstall WordPress yourself. I can see this being crazy useful for WordPress plugin and theme developers. We frequently need a fresh database to work with, so I’ll be adopting this plugin in my WordPress plugin and theme development workflow from here on. WordPress Database Reset requires WordPress 3.0+ and can be installed just like any other WordPress plugin. It’s in the WordPress Plugin directory, and can also be found on GitHub. If you’re a WordPress theme or plugin developer, you should definitely check it out.